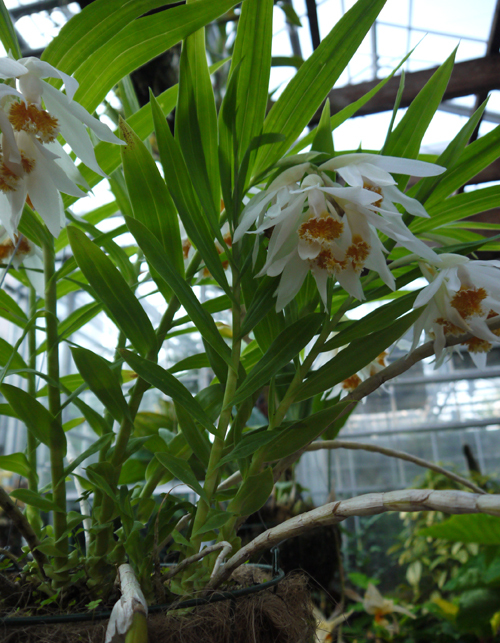 Here is a plant that deserves to be more widely grown: Thunia marshalliana, a terrestrial orchid from tropical Thailand, Myanmar and south China. 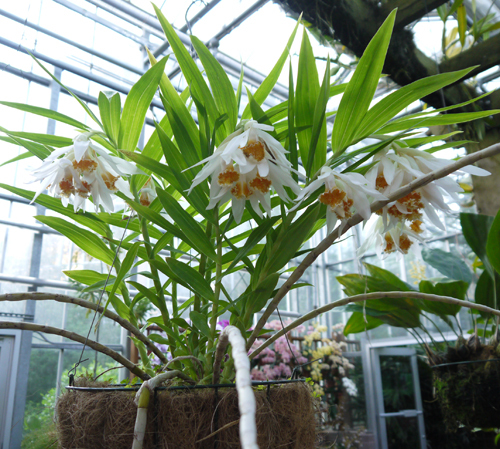 An orchid which somehow manages to be big and delicate at the same time. The flowers, whose petals have the texture and drooping aspect of a sheer handkerchief, are carried at the end of slender arching canes, and are thus best seen from below. For this reason, we grow ours in hanging baskets. The flowers are big, about 5" across. Best of all is that orange trumpet of a lip, elaborately ridged and fringed. What great texture this flower has! Thunia species are easy and terrifically rewarding to grow. From mid-spring through autumn, while the plant is in leafy growth, we water frequently and thoroughly, and fertilize like mad. Like many orchids with a strongly seasonal growth cycle, thunias are heavy feeders, at least by orchid standards. Ours get 200 ppm 15-5-15 plus a top dressing of slow release fertilizer (the type that lasts four months) at half strength. The plants shed their leaves starting in October--our cue to gradually reduce our frequency of watering. The canes are bare for about three months, during which time we water maybe once every ten days. In late March, new leafy shoots emerge. When they are about the length of my index finger, it's time to start watering and feeding again. Mature canes produce keikis (baby plantlets) at their ends, so it's super simple to make more thunias. So, why are Thunia species so hard to find commercially? I don't know! 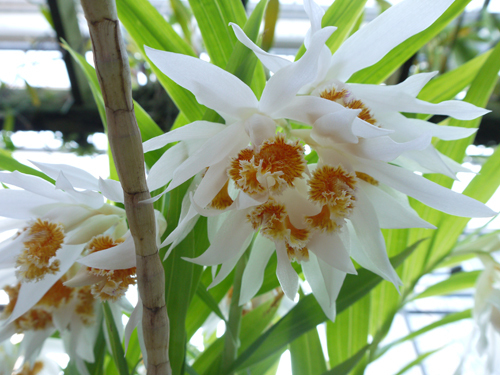 I think it's time for a revival of this fantastic orchid.